The release of the 2008 FOMC transcripts has once again focused attention on the role the Fed may have played in spawning the Great Recession. The first sign of a crack in the U.S. economy was in April 2006 when the housing sector began to contract. As seen below, it was not until two years later that the entire U.S. economy began to sharply nosedive. 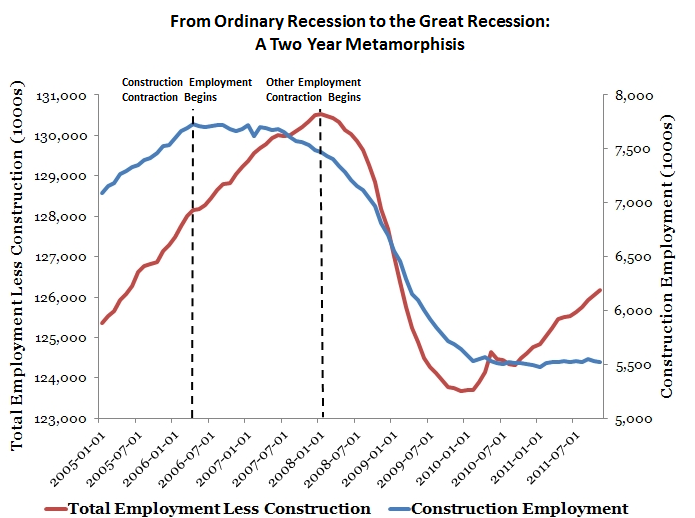 So what initially appeared to be an ordinary recession morphed into the Great Recession during the second half of 2008. So what went wrong in 2008? 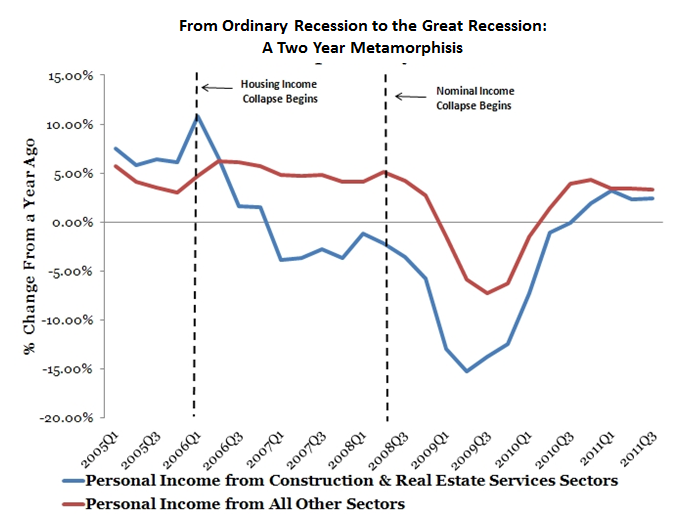 Was the Great Recession inevitable? Robert Hetzel has an entire book arguing the answer is no. He blames the Fed for falling asleep at the wheel in 2008. So do Market Monetarists. The 2008 FOMC transcripts seem to confirm this view. They show an FOMC so concerned about rising inflation that it decided to do abstain from any policy rate changes during the August and September FOMC meetings. But by doing nothing with its target interest rate, the FOMC was doing something: it was signaling the Fed would not respond to the weakening economic outlook. The FOMC, in other words, signaled it would allow a passive tightening of monetary policy in the second half of 2008. A passive tightening of monetary policy occurs whenever the Fed allows total current dollar spending to fall, either through a endogenous fall in the money supply or through an unchecked decrease in money velocity. The decline in the money supply and velocity are the result of firms and households responding to a bleaker economic outlook. The Fed, therefore, should respond to and offset such expectation-driven developments by properly adjusting the expected path of monetary policy. These two papers show the Fed effectively did this during the Great Moderation period. The FOMC failed to do this in the second half of 2008 and, according to the FOMC transcripts, it was because of inflation fears. The figures below document this failure by the FOMC. 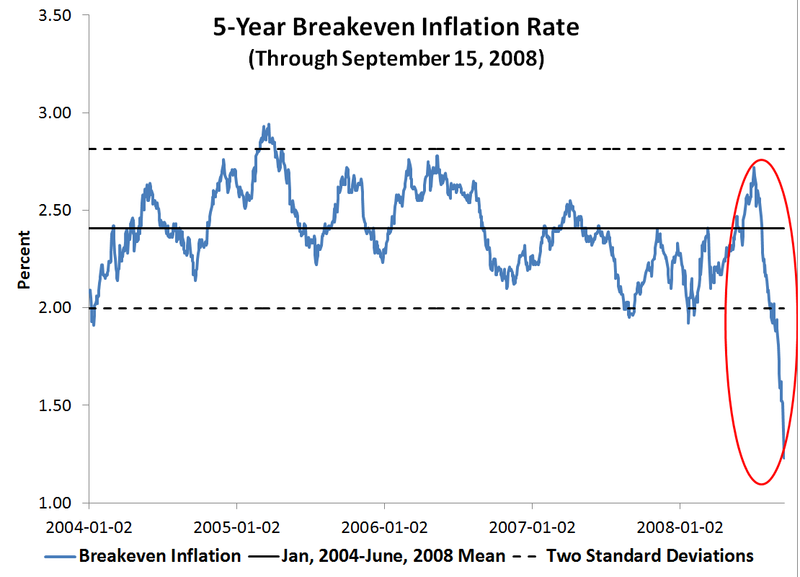 The first figure shows the 5-year 'breakeven' or expected inflation rate. This is the difference between the 5-year nominal treasury yield and the 5-year TIPs yield and is suppose to reflect treasury market's forecast for the average annual inflation rate over the next five years. The figure shows that prior to the September 16 FOMC meeting this spread declined from a high of 2.72 percent in early July to 1.23 percent on September 15. That is a decline of 1.23 percent over the two and half months leading up to the September FOMC meeting. 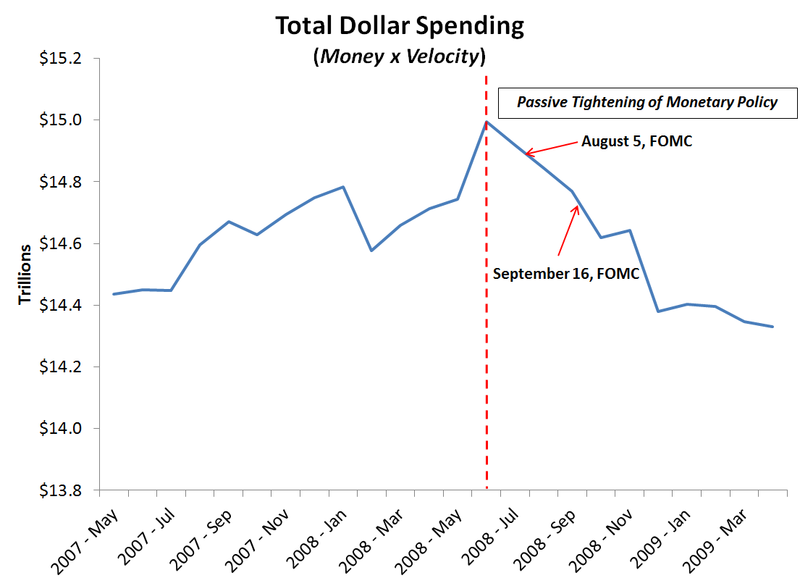 This forward looking measure was screaming trouble ahead, but the FOMC ignored it. One way to interpret this figure is that the treasury market was expecting weaker aggregate demand growth in the future and consequently lower inflation. Even if part of this decline was driven by a heightened liquidity premium the implication is the same: it indicates an increased demand for highly liquid and safe assets which, in turn, implies less aggregate nominal spending. Either way, the spread was blaring red alert, red alert! Now the FOMC allowed these declining expectations to form by failing to signal an offsetting change in the expected path of monetary policy in its August and September FOMC meetings. The next figure shows where these two meetings chronologically fell during this sharp expectation decline. The Fed could have cut it policy rate in both meetings and signaled it was committed to cycle of easing. It did not and that seems to be what turned an ordinary recession into something far worse. 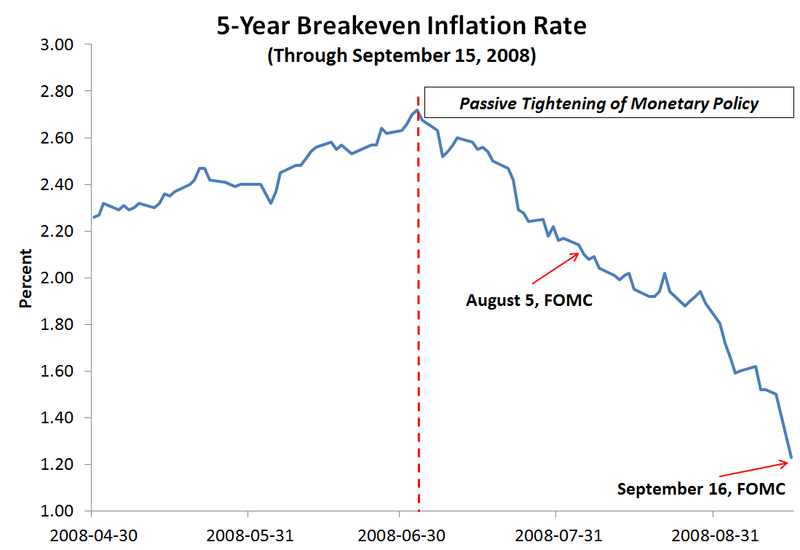 Note that this passive tightening of monetary policy preceded the worst phase of the financial meltdown. So yes, Robert Hetzel, Matthew Yglesias, Matthew O'Brien, Ramesh Ponnuru, James Pethokoukis, Scott Sumner, and Marcus Nunes are correct to claim that by doing nothing the Fed spawned the Great Recession. Not the first time this happened, I believe. Their caution in the past has caused problems. Even today, why are people talking about inflation? I believe they are misguided. Regardless of what the Fed did or didn't say; during the first quarter of 2008, The Fed funds rate was cut in half from 4% to 2%, and between August and December dropped to almost zero. Why do words [or the absence of words] trump what is actually happening in the real world? What percentage of the population has even the slightest awareness of the FOMC? Why would their announcements influence behaviors in the general population? On October 8, they announced a 50 basis point cut to 1.5%, then to 1.25% on 10/29, on 12/16 the target was reduced to 0 to 1/4%. When you consider that until the Fall of '07, the Fed Funds rate was over 5%, they did rather a lot taking it to essentially 0 in about 14 months. I was going to ask if the change could be interpreted as noise given the limited 5 year window in the graph however your counterpoint is far stronger. I think a response is necessary as to what the next action beyond dropping the fed funds rate would have been to reverse the tightening and expand the supply. JzB Interest rates are a terrible (even misleading) indicator of the stance of monetary policy. As I noted in the post, the key is to change the expected path of monetary policy. That means more than changing the federal funds rate. It means committing to keeping it low for considerable time like the Fed did in 2003 and signalling it clearly and loudly. With this policy, the Fed would have provided a check against the market pessimism that developed during this time. Instead, the Fed did the opposite: it signaled it was worried about inflation and that the expected policy path could tighten. So, yes, the correct response is far more than just cutting the federal funds rate, it is about setting expectations about the future path of policy and the future economic outlook. Gary Gorton provides evidence that many of the CDOs and MBS were not subprime, but when the market panicked a liquidity crisis became a solvency one. Had the Fed responded to the falling market sentiment in the second half of 2008 the shadow bank run in late 2008 may never have happened and the resulting bankruptcies been fewer. 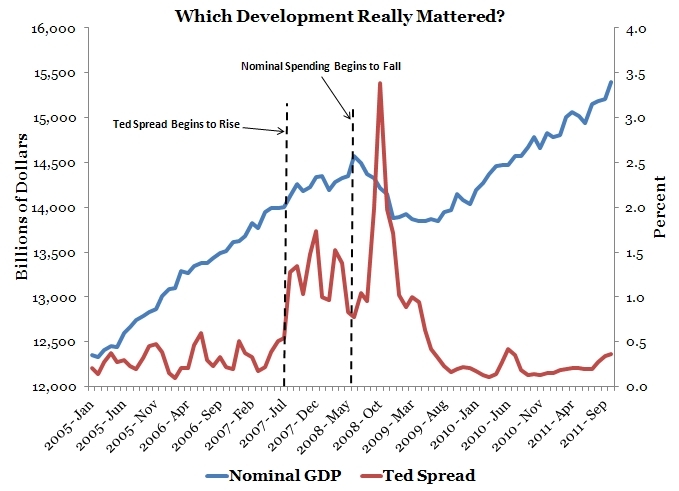 As I briefly mentioned in the post, the worst part of the financial crisis took place after this period of passive Fed tightening (see the associated link to Ted spread figure). This is very similar to the Great Depression when the Fed allowed the aggregate demand to collapse first and then the banking system followed. Unlike the Great Depression, though, the Fed did eventually get aggressive with its QE programs so outcome was better. The Fed is getting the blame for the failings of the whole economy and the errors of the government and yet does not protest the errors of others. The economy has functioned well enough with tight money in the past. As with the hammer, every solution is seen to be a nail by the Fed. What about all the other economic solutions: the proliferation of taxes on the profitable, regulations upon regulations upon legal liability upon legal liability, upon both the profitable and the yet-unprofitable and more importantly on those still just planning? What about vilification of business as greedy and heartless combined with the false Robin Hood position taken by the Left? Vilification of the profit that is the life’s blood of commerce must be discredited. Ninety percent of the impoverished of working age are unemployed. The economy is not only missing the value they would have created, it is robbed of the transfer payments which require no value given by the recipient and no value received on the part of the giver. In the days of barter, the value exchanged was right there for all to see; the advent of money has confused this transaction by hiding and confusing value with the exchange of money. I'm by no means recommending a return to barter, only for economists to recognize that value is the substance behind the economy and the standard of living, not money. You can have a simple economy with just barter or self sufficiency, but you can't have an economy with just money. Let’s shift the emphasis to getting everyone back to work using all the tools at hand. Once the boats start to float, lets concentrate on getting them to work, not putting them on top of 20,000 feet of water.